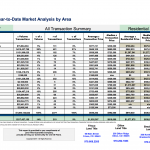 Market Analysis by Area for November 2017: There were a total of 230 transactions and $151,871,354 in monetary volume. The average transaction price for all 18 reported areas, plus Deed Restricted transactions, was $663,600, average residential price was $694,513 and average residential PPSF was $451. 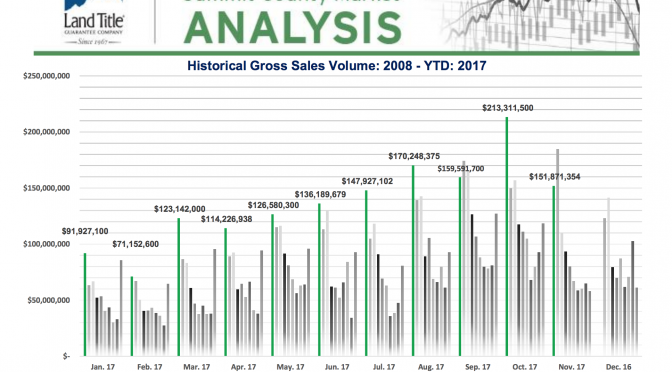 Year to Date Market Analysis (11 months): Monetary volume in YTD 2017 totaled $1,506,142,622 with 2377 transactions: $646,352 average transaction price, $679,530 average residential price and average residential PPSF $430.  Market Snapshot for Years 2017 vs 2016: Average Indicators for $: Single Family +16%, Multi- Family +15% and Vacant Land -5%. Median Indicators for Single Family +17%, Multi- Family +16% and Vacant Land -9%. Market Analysis % Change YTD 2017: Monetary volume ($151,871,354) in November 2017 was down 18% from November 2016. Transactions (230) also down 14% from November 2016. YTD 2017, monetary volume is up by 17% and transactions are up 4% compared to YTD 2016. Residential Market Sales by Price Point: Residential volume in November had 200 transactions with $138,902,688 gross volume. There were 24 properties that sold for $1M and above in November. The most active price points were between $300K-$400K with 37 transactions. There were 64 Single Family, 136 Multi-Family and 17 Vacant Land transactions in November. 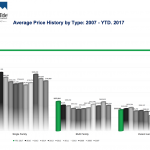 Average Price History by Type 2017: Average price for residential Single Family: $1,084,991, Multi- Family: $470,841 and Vacant Land: $335,949. Comparative Historical Cost Analysis 2017 YTD: There were 2010 residential transactions and $1,365,855,333 gross $ volume with 311 properties selling for $1M and over-compared to 2016, there were 1921 transactions and $1,098,827,441 gross $ volume, 203 properties at $1M and over. In 2015, there were 1870 transactions with $1,027,115,318 gross $ volume,182 properties at $1M and over. Top Lender Graph: There were 458 loans in November, 68% (157) of the loans were related to sales, there were 149 REFI’s and 152 loans were timeshare related. 32% of the real estate closings were cash transactions. 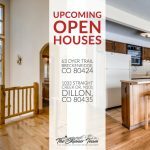 Market Highlights: Please see page 10 of the Market Analysis- You can note the higher priced sale in November on French Street in Breckenridge. Also, a Crystal Peak Lodge property was the highest PPSF at $904. There were no bank sales in November. Foreclosures: Actions were down with 2 in November, compared to 6 in November 2016. There have been a total of 43 Foreclosure actions YTD. Purchaser Profile Abstract: There were 27 upper end sales in November. Our buyers for real estate transactions in November were Front Range demographic at 43% of our market, 29% are “local” and 28% are out of state buyers with 0% International. Land Title New Development Summary: This (page 16) shows all the new construction each month, there were 22 in November compared to 33 in October.